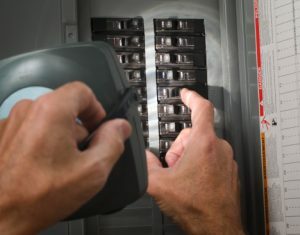 It’s important to know where the circuit breakers are located on every job site. There may not be anything as simultaneously necessary and dangerous on a worksite as electricity. It powers our tools, lights our workspaces, help operate machinery, and helps us clean up. But any electrical application that isn’t in proper working order presents a potential health hazard that can be difficult to identify. This week we are going to go over common problem areas when it comes to electrical safety in the workplace. Wires are like roadways for electricity, and just like roads whenever a spot is damaged it can be dangerous. Exposed wires in an extension cord or power tool can be a serious hazard since the electricity traveling through the wire can escape. It’s important to inspect all wires for damage before there is current running through it. In the event of an electrical emergency it’s important to know where the circuit breakers are located so you can cut off the electricity at the source. A circuit breaker works to interrupt the flow of current by detecting overload or a short circuit. A GFCI, or ground fault circuit interrupter, protects you if you are working in damp conditions. This safety measure will cut electricity to an outlet or receptacle before a harmful current occurs. Most outlets have GFCIs built in, but portable in-line GFCIs are available if you’re not sure the receptacle you’re using has one. This entry was posted on Friday, August 12th, 2016	at 10:46 am	. Both comments and pings are currently closed.